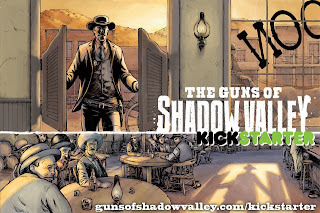 I'm very pleased today to present an e-mail interview with the creative team behind an excellent webcomic that is being turned into a graphic novel, The Guns of Shadow Valley. 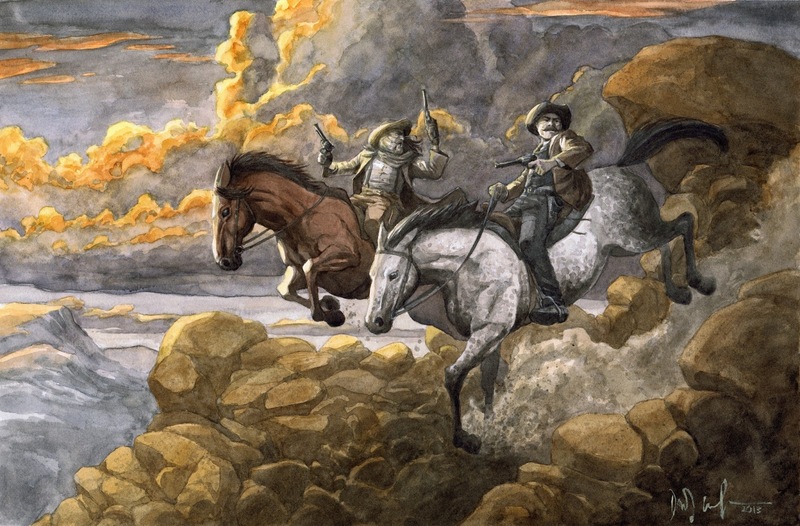 Co-creators Dave Wachter and James Andrew Clark were kind enough to give me some of their time to talk about the process of creating the story, putting it up as a webcomic, and more. While I have not read any of Mr. Clark's prior work, I have been an admirer of Mr. Wachter's artistic skills from when I first saw his work doing commissions at a show (it might have been Baltimore in 2010). He's got an amazing eye for detail even in his smaller art pieces and his designs of famous characters, from Ben Grimm to Bela Lugosi, is outstanding. Last year, he did the art for IDW's Night of 1000 Wolves and knocked it out of the park. If you are intrigued by what you see here, their kickstarter campaign is still active, and while already funded, it's a great way to help ensure this comic is published in print form and ensure you get a copy of the book, either electronically or in print. As a disclosure, I am a backer of this Kickstarter. Now, let's move on with the questions! Panel Patter: For those who are unfamiliar with you as creators, can you give a little history of your past works, both together and separately? JIM: Dave and I started working together on a 5-issue super-hero mini-series called "Scar Tissue" back in 2004. That was our first foray into the world of comics. I've written some short comic stories for various anthologies over the years. Late last year I put out a children's book and an album of ukulele music. DAVE: I've done the art on several books for IDW: Night of 1,000 Wolves, That Hellbound Train, an issue of Godzilla and on Teenage Mutant Ninja Turtles, an issue of the current Villains micro-series featuring Old Hob. Also, I've got a new mini-series with writer Steve Niles for Dark Horse called Breath of Bones: A Tale of the Golem, the first issue of which hit stores a couple weeks ago. Panel Patter: What drew you to working in comics? JIM: I read some comics when I was a kid, but I didn't really become an avid comic reader until I was well into my adult years. When I finally got into comics again I immersed myself. I really enjoyed the dramatic comics that were aimed more towards adults and wanted to make those. I had been writing a lot of short fiction and wanted to try my hand at a comic script. From there I was hooked. DAVE: I've been reading comics since I was 9. The first thing I did after reading my first issue was start working on drawing one of my own. In those formative years I created a ton of characters, wrote and drew a bunch of my own comics. Then I quit reading comics around age 17, and was away for 7-8 years. After I started getting back into reading comics for a few years, I made the decision to try drawing them again. I instantly realized what I had been missing during those in-between years, and soon set out to create a career making comic books. Panel Patter: Who do you feel are influences on your work? JIM: Some of my favorite writers are Steve Niles, Neil Gaiman, Kurt Busiek, Garth Ennis, Timothy Truman, and Robert Kirkman. Those guys inspire me to write more and do it better every time. A few years ago, while I was still writing "Scar Tissue", Kirkman bought the book at Comic Con and gave me a lot of encouragement and some sage advice on writing comics that has influenced my writing method tremendously. DAVE: Will Eisner, Joe Kubert, Jeff Smith, Alan Moore, David Mazzucchelli, Mike Mignola, Bernie Wrightson, the Hernandez brothers, it goes on and on. And this list would be different if I answered this question tomorrow. I think I most admire the writer/artists, the ones who use both talents to make a work that utilizes the best qualities of a visual storytelling medium, and is wholly of themselves as artists. Panel Patter: Those are some great choices, and a few are favorites of my own. Tell me about Guns of Shadow Valley. What can readers look forward to seeing in in book form instead of a web comic? JIM: It's a is a Wild West story about a posse of gunmen with superhuman abilities who go up against an entire army led by a madman Colonel. The look and feel was modeled after some of the great old wide-screen western movies we grew up watching. The western motif is infused with other elements such as sci-fi, steampunk, superpowers, mysticism, and folklore. If you can imagine "X-Men meets The Magnificent Seven," then you have a good idea of "The Guns of Shadow Valley" and its theme. DAVE: In book form you get all the tactile sensations of a real live book. It's going to be oversized, hardcover, it's going to be beautiful. Also, there will be a bunch of extras in the back, like character sketches, layouts, process pages, that kind of stuff. And the better we do on the Kickstarter, the more we're including to go along with the book: stickers, bookmarks, art prints, etc. Panel Patter: What inspired you to create Guns of Shadow Valley? DAVE: I just had a simple mash-up idea: superpowers in the Old West. From there sprang a few ideas of characters and stories that could be told. I had those floating around in my head for a few months. Jim and I had finished up our first series together, Scar Tissue, and I told him of my concept. He really liked the sound of it and together we started coming up with more and more ideas until The Guns of Shadow Valley was born. Panel Patter: Why did you start Guns of Shadow Valley as a webcomic? DAVE: We originally envisioned it as a comic book series in print. We shopped it around to publishers, but never got a deal that we were satisfied with. A friend of mine, Bryan Deemer from Comic Geek Speak, had suggested to me that we might try it as a webcomic. Jim thought it was a good idea, too. It's not like we were going to make any money out of a publishing deal as two creators still fairly new to the business. We figured we could cut out the costs of printing and grow an audience, with the intent of someday printing a collected edition. Panel Patter: That makes a lot of sense. Even with a publisher, it's hard to make a go of it, based on Jim Zubb's breakdowns, which frankly floored me. What are the big differences (advantages, disadvantages) of working on a webcomic instead of a traditional print comic? JIM: For one thing, it's a bit easier to put the comic online in a serialized fashion than it would be to print up paperback copies. Certainly less expensive to start a new project that way, build an audience, and get a feel as to how well it's being received based on the instant feedback from readers. Plus, I think it puts some interesting challenges on us creatively, to write for something that the reader absorbs in short little bursts. It has to capture--and hold--their attention a bit at a time, but it also has to work when read all at once. DAVE: The immediate feedback is nice, you don't have to wait months after a book is out to hear what people are thinking. One drawback is that we don't have new books to sell to people at conventions. And there's always going to be a segment of the population that only wants to read a physical copy. Panel Patter: Can you describe your collaboration process together? This isn't your first time coming together for a comic. JIM: Dave and I are on opposite ends of the country, so it's a different vibe than if we were hashing things out in the same room together. We discuss the plot and narrative structure over Skype, then we take turns writing script drafts, followed by notes and revisions over email. Once we have a script we agree on, Dave busts out the pencils. DAVE: Not really any "pencils" though. I rough out the pages on the computer using Photoshop and a Wacom tablet. I get it to a loose "pencil" stage, when I print that out onto art board in blue line. I ink that by hand, scan it back in, and do the colors, again in Photoshop. Then it's off to Thomas for the letters. He also preps the files for display on the screen. Panel Patter: I would never have guessed this was digital pencil work, but I guess that's my old-school bias showing! There are far more prominent independent comics projects than there used to be, both associated with publishers and projects like Guns of Shadow Valley. Why do you think that is? JIM: It's a far easier thing to make comics today than it was 10 or 15 years ago. There's less of a reliance on a big-name publisher and distribution through direct market. Digital printing is cheaper, faster, and can be made in smaller quantities. Webhosting is easy, so anyone can make a webcomic. And for those who do want to go with a publisher, there's more opportunity to "network" with industry contacts online, and the submission process is sometimes easier (although not always faster to hear back). DAVE: Creators are seeing that you can't count on a lifetime of work from the publishers the way previous generations could. Everyone is a freelancer, fighting to survive and buy their own medical insurance. Royalties are an endangered species. The best way to do well for yourself in the long run is to create stories and characters that you own. Don't rely on somebody else, forge your own path. Panel Patter: Very good points. What's next for you after this project is finished? JIM: Since it looks like our Kickstarter will actually be funded, we'll be focusing on The Guns of Shadow Valley for a while. DAVE: As a "young" freelancer (that is, I've only been at it full time for a few years) having six months worth of work is the most foresight I've had into the future. What happens after that? Your guess is as good as mine. Panel Patter: Thanks to both of you for taking the time to do the interview! Best of luck finishing up strong with the Kickstarter, and I hope to see more projects from you in the future.